Have you every wondered why God doesn’t heal you? Have you asked Him? 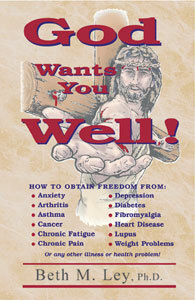 Find out what God wants from you so you can be healed and free of health problems. Find out what you may be doing wrong to hinder God’s answer to your prayers. Find out which foods to eat to help you prevent common health problems such as diabetes, cancer and heart disease, and which foods to avoid. The Bible gives us awesome insight on how we are to take care of our bodies and what we need to do to be healthy and whole. This is what God wants for us. God wants us well! The author, Dr. Beth M. Ley, has written numerous health books, but in this book she shows you how to overcome health problems with the help of God. It tells the story of how God healed her and how He can heal you too!